Caroline Bedell Thomas was a rare woman pioneer investigator of risk predictors in a population of youth, spending much of her career working from the student dispensary and the adult cardiac clinic at Johns Hopkins Hospital. She was educated at Smith College and Johns Hopkins, getting her MD in 1930. She fascinated the fledgling American Heart Association CVD epidemiology group meetings by calling attention to cardiac risk in youth and with data from her Precursor Study among Hopkins medical students, when most emphasis at the time was on heart attack risk in middle-aged men. Her examinations on 17 consecutive Hopkins medical school classes starting in 1944 have been followed up for more than 50 years, from an extensive battery of questionnaires, biomarkers, and function tests. She held to a broad concept of “psychobiology,” and indeed found interactions in predicting CVD and cancer among traditional CVD risk factors and anger, anxiety, and depression. Please click here for a description of the Johns Hopkins Precursors Study. Changing the Face of Medicine, online exhibit, National Library of Medicine. Accessed May 30, 2006. www.nlm.nih.gov/changingthefaceofmedicine. 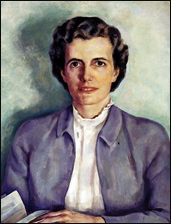 The Caroline B. Thomas Collection, Alan Mason Chesney Medical Archives, Johns Hopkins Medical Institutions, http://www.medicalarchives.jhmi.edu/sgml/thomascb.html.